I know how you all feel about uni-taskers—products that are designed for one specific use and aren't great at much else—but pizza is one of those dishes that simply beg for specialty tools. Some of these just make the job easier (say, a pizza wheel or a food processor). But it's simply impossible to make some types of great pizza without certain other tools, like peels and some sort of baking surface. I've been making pizza professionally and at home for many years now, and have tested dozens upon dozens of tools and gadgets. Here's my list of the most useful products you can get right now to step up your pizza game. If you've never made pizza before, these are the first tools you should spring for to start baking like a pro at home. This is the one. A scale is the number one most important tool for making consistently good pizza from scratch at home. Forget measuring cups and spoons; they simply aren't accurate for baking, and without accurate measurements, you can't make consistent dough. (Read more about why mass is the best way to measure for baking here.) The OXO Stainless Steel Scale features dual metric and imperial units (I make pizza almost exclusively with metric), an 11-pound (5kg) capacity, and a large, easy-to-read, backlit display that pulls out, so even the largest bowl won't block your reading. The only downside is that the scale has an annoying auto shutoff that will not only turn off the display, but also re-tare itself if you leave the unit on for more than a few minutes. Just make sure you don't get distracted in the middle of measuring. A bench scraper will help you scrape up random bits of dough stuck to your counter and clean up dustings of flour with ease. You'll be using this for so much more than pizza; it's also great for picking up chopped herbs or garlic and transferring them to a pot on the stove. 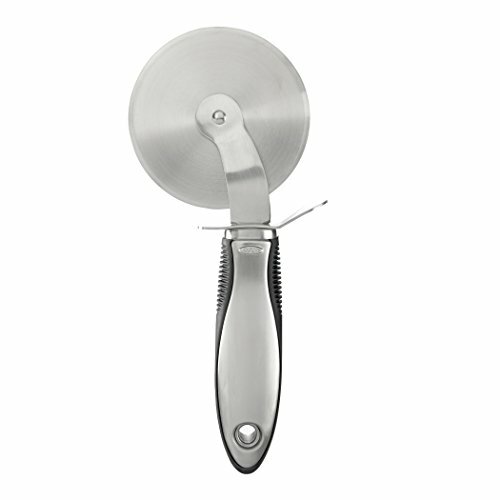 The OXO Stainless Steel Scraper also has a relatively sharp blade that makes it ideal for splitting large balls of dough into individual pizza–sized portions. When The Original Baking Steel came out four years ago, it completely changed how I cook pizza indoors. With greater conductivity and higher volumetric heat capacity than a baking stone, it'll produce pizzas with crisper crusts and deeper char, even in the same temperature range. More importantly, pizza stones tend to crack with use (as a heavy user, I went through about a stone per year), while a solid slab of steel will last a lifetime, or longer. For even more versatility, I'd suggest going with the dual-sided steels, which have a pebbled surface for baking pizza and a smooth surface with a routed channel to use as a stovetop griddle. I keep a Baking Steel griddle on my stovetop at all times (when it's not baking pizza, that is) for frying eggs, searing steak, smashing burgers, and crisping potatoes and vegetables. Here's my recipe for a basic New York–style pizza. Many first-time pizza makers try to save money by opting to purchase a single, metal-bladed pizza peel. This is a mistake. Raw pizza dough is much more likely to stick to metal than to wood, so, unless you're an expert and can get your pizza topped and launched into an oven in under, say, a minute, chances are you're going to run into sticking problems. Wooden peels absorb excess moisture and have a rougher surface, which means that your stretched and topped dough will remain loose and easy to launch far longer, saving you from potential pizza-spilled-all-over-the-oven accidents (and you know you've had those). If economy is your goal, the New Star Foodservice pizza peel will work fine, though I personally love my Perfect Peel Baker's Board, handcrafted to last a lifetime from gorgeous solid cherrywood. They'll even put your initials or logo on it if you'd like! Wooden pizza peels are for launching, but they're too thick to easily slide under a pizza once it's hit the oven. For that, you'll want a thin-bladed metal peel, like this basic Kitchen Supply model. These thin-gauge aluminum peels are just fine for the occasional baker, but they'll bend and warp eventually. If you're going to be making pizza multiple times a year for many years to come, you might want to spring for something a little more heavy-duty. I use the KettlePizza Pro Peel, which has a thick-gauge aluminum body that extends fully past the solid teakwood handle. It even has a built-in bottle opener (you know how easily those go missing during a cookout, right?). Mine has been through a half decade of intense use and shows no signs of slowing down. Most types of pizzas require special equipment to cook properly, whether it's devices to provide the intensely high heat necessary for Neapolitan or New York–style pizzas, or special pans and baking dishes for pan pizzas. I did full review of the best backyard pizza ovens. But to save some time, you can read about my recommendations right here. It took a partnership between the makers of the KettlePizza and the Baking Steel (along with a little cajoling on my part) to come up with the Serious Eats–Edition KettlePizza/Baking Steel Combo Kit, but for my money (around $400 at the time of this writing), it's the most effective and versatile way to get wood-fired oven temperatures in your own backyard. The stainless steel insert fits in between the base of your existing kettle grill and the lid, providing an opening to launch pizzas onto a custom-designed baking stone. Above it, a solid slab of steel stores and emits radiant heat to cook the tops of your pies. Fired up with coal and wood, the kit can achieve bake times of just a couple of minutes per pie for the ultimate in crisp and tender crusts. Pros: It's the most similar to working with an actual wood-fired pizza oven. You'll have to manage air flow and wood placement, but in return, you get full control over exactly where the heat is going and how your pizza bakes. Because of its large mouth and interior space, you can also use the KettlePizza for cooking things other than pizza. Try roasting oysters in it, or crisping up a spatchcocked chicken. Broccoli and Brussels sprouts will take on a gorgeous, smoky char, while miso-marinated black cod comes out caramelized and moist. The large, flat surface of the Baking Steel lid also doubles as a griddle—ideal for giving your steaks and burgers a dark char and crisp crust. Cons: The oven takes practice to get used to. You will definitely scorch the bottoms of your first few pies as you figure out the optimal coal and wood arrangement and hone the craft of rotating and "doming" pies (that is, lifting the pizzas up toward the roof of the oven as they cook in order to char their tops evenly). Because of the large thermal mass of the Baking Steel, this setup also takes a fair amount of time to preheat—half an hour at least. Here's my Neapolitan pizza recipe. Read more about the Serious Eats–Edition KettlePizza/Baking Steel Combo Insert here. Note: Serious Eats does not receive any money from the sale of Serious Eats–Edition KettlePizza/Baking Steel kits. Ten percent of all sales are donated to Feeding America, the nation's largest hunger-relief charity. The Uuni 3 is a compact oven that, I believe, was the first of its kind on the market several years ago, pairing portability and compactness with some serious heat output. The stainless steel box houses a heat deflector and a stone floor. You light up a pile of wood pellets in a little tray in the back of the unit, then load more wood pellets into a metal hopper, which continuously feeds them into the fire via gravity. As the pellets burn, the flame is drawn over the stone, across the top of the oven, and out a tall chimney in the front. With a good fire in there, you can preheat that stone to over 750°F in just about 15 minutes, with air temperatures rising above 900°F. Pros: I really like the use of wood pellets for the fire here. It doesn't have quite the romance of actual pieces of hardwood, but pellets are cheap (about 50 cents a pound at your local home goods store), they burn reliably, and they're easy to get going. A 30-second zap with my Iwatani butane torch, and it's good to go. Cons: Even once the thing is properly assembled and fired up, there are some issues. The biggest is consistency. Working with live fire is never a set-it-and-forget-it situation, but the small pellet burner in the back of the Uuni seems to have more quirks than most live fires I've worked with. The airflow needs to be exactly right in order for it to burn efficiently--I've found that I have to reposition my oven frequently to keep even a small breeze from disrupting the flow of oxygen to the pellets. Even having the back of the oven a couple feet away from a fence seems to affect how efficiently it burns. My Foolproof Pan Pizza is one of my most popular recipes of all time, and for good reason. It allows you to re-create crisp-edged, flavor-packed pizzeria-style pan pizza at home with no kneading, no stretching, and no real experience required. The only thing you need is a pan to bake it in. I typically recommend a cast iron skillet. The only problem is that with a cast iron skillet, you'll most likely have to finish off the pizza on the stovetop to get proper crispness in the bottom crust. For a single-use tool that'll do the job better at the cost of less versatility, go with a dedicated pizza pan. Making pizza for a crowd? Nothing beats a big ol' square pie (often referred to as a Sicilian) to feed a party with minimal effort and maximum deliciousness. Best part is, you don't even need a pizza stone or steel. All you need is an inexpensive rimmed aluminum baking sheet (which, of course, is also the best tool for roasting chickens, vegetables, and, well, pretty much anything else). You can find my recipe for square pizza here. The classic Detroit pizza pan is a deep, 10- by 14-inch rectangle of metal with black surfaces (for better conduction) and sides that flare gently away from the bottom. While the original pans were made from blue steel, most modern pans are made from anodized aluminum and come with a nonstick coating. I tested a number of these pans and found that yes, the black surfaces really did make a difference in how well that cheese crisped. The best one I tried was this one from LloydPans, which has been making these pans since the '80s. This is a specialty item for sure, but once you try this recipe, I can guarantee that you'll be using it with regularity. These tools aren't strictly necessary for any style of pizza, but having them will make baking pizza much easier. While large, industrial-scale stand mixers may reign supreme in pizzerias, the food processor is the best tool for making pizza dough at home. Its rapid blade movement creates a much stronger gluten network than the slow kneading of a stand mixer, and it also allows less oxidation of the flour, resulting in better flavor. Your dough will come out smooth, supple, and easy to stretch, even if you plan on making your dough the same day that you bake it. If you're in the market for a new food processor, you should check out our latest review on the subject. After rigorous tests, we found that the Magimix produces the best 14-cup food processor. Its innovative dough blade kneads pizza dough better than any other machine we used. Pizza peels are large and cumbersome to store. I keep mine hanging up against the side of my cabinet using a guitar hanger. They stay up and out of the way, but within easy reach whenever I need 'em. I can't seem to find the particular model I have anywhere, but there are plenty of options on Amazon. I never thought I'd love my dough-proofing box as much as I do until I got it. Up until then, I'd been proofing individual balls in plastic containers or in plastic-wrapped bowls. Now I just shape my dough balls, plop them into the proofing box, snap on the lid, and walk away. The tight lid keeps them from forming a skin, while the smooth plastic surface makes them easy to lift onto your stretching surface. I bought mine at a restaurant supply store, though you can also find them on Amazon. Don't forget the lid. You want to get that perfect chunky-yet-saucy consistency out of your canned San Marzano tomatoes? You can use your fingers to squeeze them (messy) or a potato masher, but I recently started using a pastry cutter and haven't looked back. The stiff, sharp blades make quick work of tomatoes, chopping them as coarsely or as finely as you'd like, directly in the saucepan. A drizzle of olive oil before and after baking gives your pie a great boost of flavor, and little plastic squeeze bottles are the easiest, most inexpensive way to store and dispense it.